Have you ever heard about such a cool tricks? Come here and Moustachini will show it to you! As you have already understood, your main goal is to throw rabbits and collect all the stars here. Be very careful and do only the correct tricks. You will cope with it. Wow! It is really amazing! Cause this time you will be in a unique and exciting role to entertain and to perform in front of a lot of people, so be sure that you are good at what you are doing. Could you believe that? Just imagine that you are in the real circle and play it! 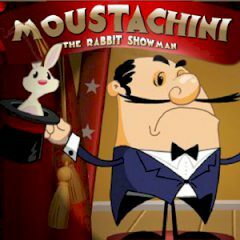 By the way, it is a rabbit show and the precise goal of Moustachini is to pick up as many stars as possible, but it will need some super skill to make the rabbits do the best thing. So, everything depends on you now! Have fun!